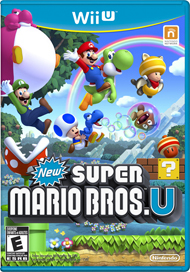 The Newer Super Mario Bros.
New Super Mario Bros. U is the supposed killer app that will sell the Wii U. Why? Because it's a game that has Mario in the title and Nintendo fans will flock from all over just to get a chance to see the plumber in action once again. As you can probably surmise from the title, New Super Mario Bros. U is a sequel to New Super Mario Bros, Wii, and it plays essentially the same. You and three of your friends get to run through traditional 2D Mario stages together, sometimes helping each other out, and sometimes griefing each other for the heck of it. The big change this time around is that a fifth player can step in with the Wii U GamePad and affect the environment around the other four players. This sounds kind of tacked on, but to the contrary it's quite a bit of fun. 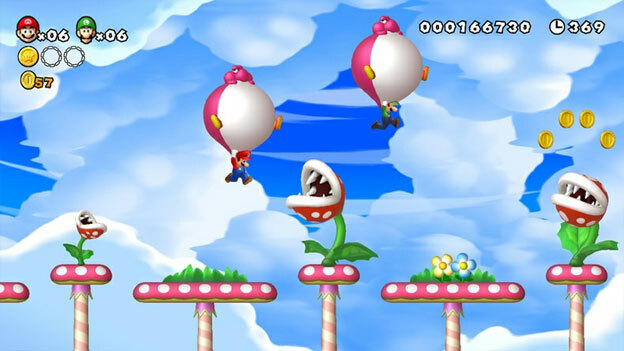 The primary function of the fifth player is to create platforms in mid-air to aid the other players' progress. These platforms are solid and breakable, and can be used in many interesting ways. For example, you can use them to prevent your allies from falling into pits, just as easily as you can use it to create false ceilings when there are environmental hazards above them. When Nintendo walked me in for the demo, I was put together with four rather proper looking businessmen from their home office in Japan. They decided to play as the characters while I controlled the environment. Obviously, I decided to place platforms above them in mid-jump to make them fall down every pit they came across. I'm kind of a jerk that way. The GamePad player can do much more than simply create platforms, though. By touching aspects of the environment, he can manipulate the stage in ways that help or hinder the other players. For example, there was one section where the GamePad player was able to speed or slow rotating platforms. The GamePad player can also hold enemies in place or outright defeat them. Tapping on a koopa, for instance, makes it retreat into its shell, which allows your allies to pick it up as normal. Of course, the Wii Game Pad player can also aggravate enemies such as piranha plants. Once again, I spent most of my time making piranha plants snap at my allies, just for the lols. As far as the game itself goes, nothing much has changed. 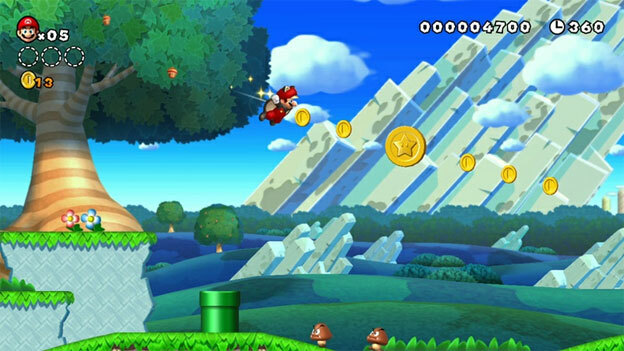 The controls are still the same basic run, jump, and spin controls from New Super Mario Bros. Wii. However, like any good Mario title, this one has a host of new power-ups. The newest suit is a flying squirrel suit which allows Mario to have a double jump and a glide. It also allows him to cling to walls for extended periods of time, which helps when performing wall jumps. Old power-ups have been altered as well. The fire-flower, for example, shot much slower and seemed to be far less effective than previous fire-flowers. Baby Yoshis also return, except this time they do more than simply eat and grow up. Holding a baby Yoshi will allow you to use several different abilities based on its color. The baby Yoshi we used was able to puff itself up like a balloon to carry us across long distances, but trailers have shown fireball spitting Yoshis, lamp light Yoshis, underwater Yoshis, and more. These Yoshis can be used in conjunction with your normal power up, so the balloon Yoshi combined with the flying squirrel suit could pretty much get to any height easily. The Nintendo rep assured me that this is just a small selection of the power-ups that will eventually be available. Many more will be coming, supposedly enough to rival Super Mario Bros. 3. There are a number of possible future fixes that I was told might come to the game. 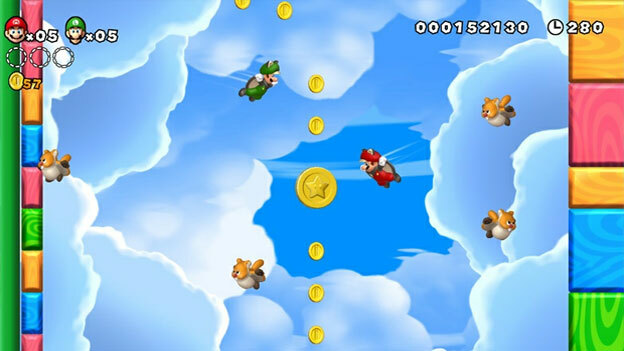 For example, right now all four players can collide with each other, causing each other to fall into pits accidentally just as they did in Super Mario Bros. Wii. However, the Nintendo rep said that they might include an option to make players intangible to each other, allowing them to play the stage together without interfering with each other. In addition, the Wii GamePad player could not pop the bubbles that dead characters returned to the stage in. This too may be changed in later builds. There were also a lot of functions that I was told simply weren't able to be shown on the show floor. For example, you can play the entire game using just the GamePad, and you can transfer saves from a TV playthrough to it, allowing you to carry the game around your house. You will be able to connect to the Miiverse in order to leave notes on the world map and stage itself, giving people tips and posting scores and challenges to the community. You can even choose to play the game as one of your Miis, which was shown on the show floor but wasn't particularly interesting considering only stock Miis were used. As of now, the only characters other than Miis that you can play are Mario, Luigi, Yellow Toad, and Blue Toad. However, I was told that there is a possibility that more Mario characters might get into the mix as well. Dibs on Wario! Overall, New Super Mario Bros. U was fun and contained a few innovations, but it wasn't actually all that new. The graphics look exactly the same as New Super Mario Bros Wii, which was already pretty minimalist for its generation. 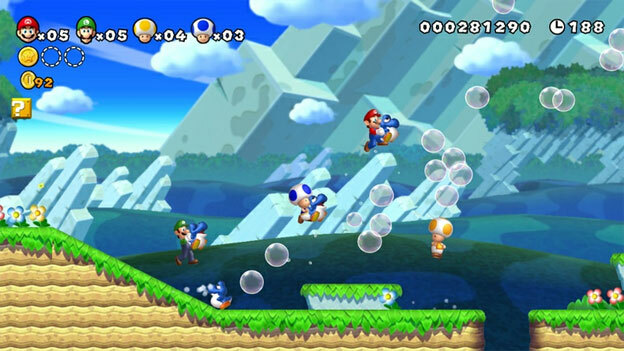 The levels had brand new themes, many of which harkened back to the days of Super Mario Bros. 3 and Super Mario World, but they all felt exactly the same as the original New Super Mario Bros. Wii levels. Now, that's not to say that the game isn't fun. On the contrary, it's a blast and will probably be the center of attention at many parties and in many Youtube speed-runs. However, it simply doesn't hold any surprises, at least not yet. If you are buying this game, you are simply buying more 2D Mario, and to be honest that's all that many potential Wii U owners want. Brand new power-ups and baby Yoshis. Levels based on Maro games of the past.